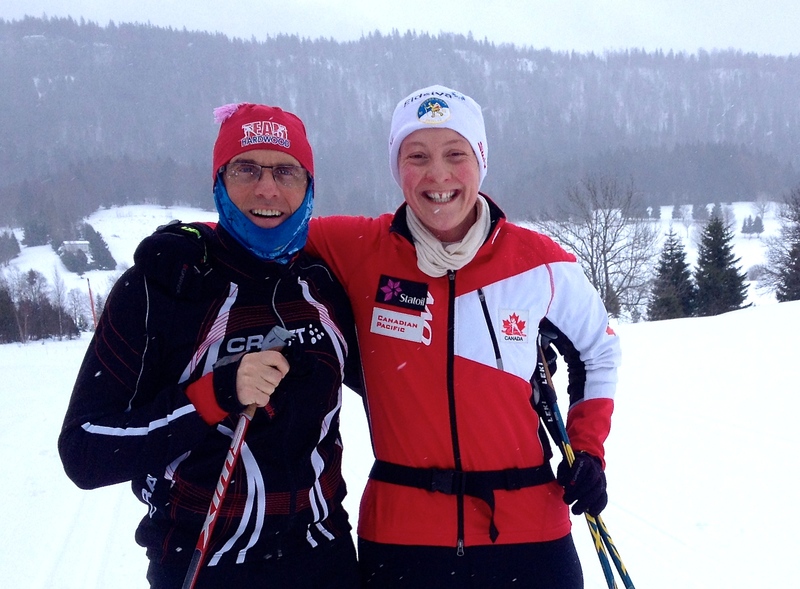 This is a post for my xc ski buddies (who are no doubt thinking about xc skiing – in August). As a competitive xc skier I have long fantasized about participating in one of the big Worldloppet series xc ski races in Europe, ever since setting eyes on photos of thousands of skiers snaking across its frozens lakes and through its alpine valleys. 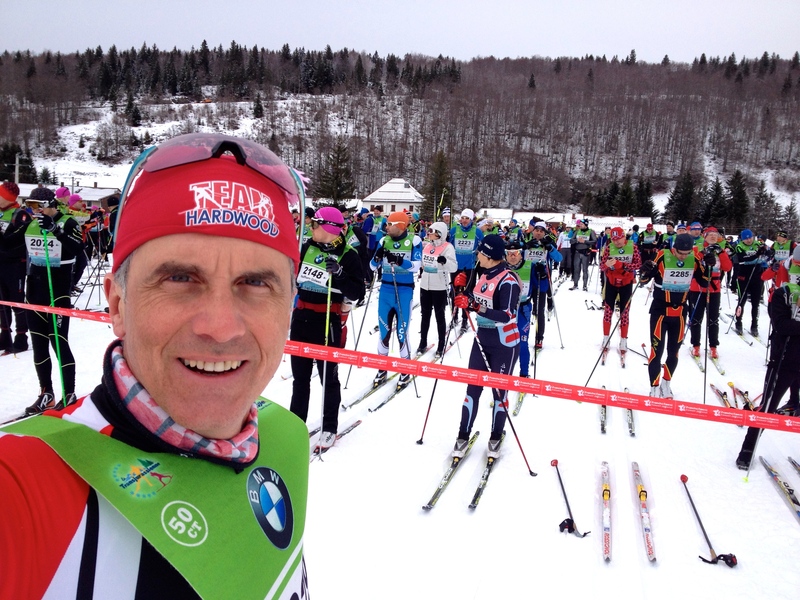 I have completed Canada’s own Worldloppet race – the 50km Gatineau Loppet – several times and it’s a great event; but with barely 2000 competitors over 2 days of racing, it pales in comparison to the big European races, which regularly feature fields of up to 10,000 or more! Upon moving to Switzerland I resolved to participate in as many Worldloppets as possible while I had the opportunity. 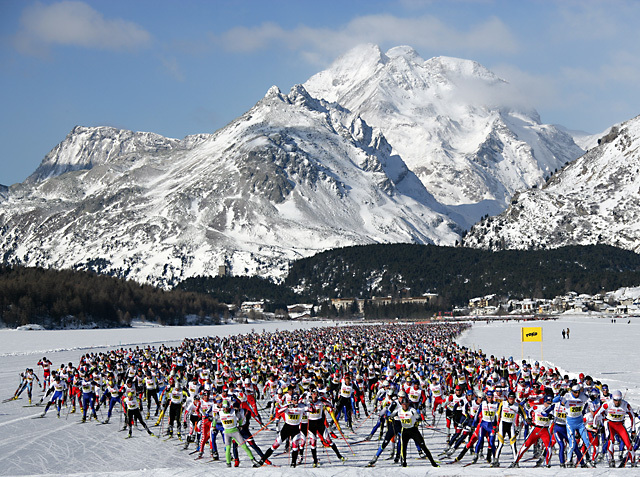 Thousands of xc skiers snaking their way across Lake Sils after the start of the Engadin Ski Marathon, near St Moritz. 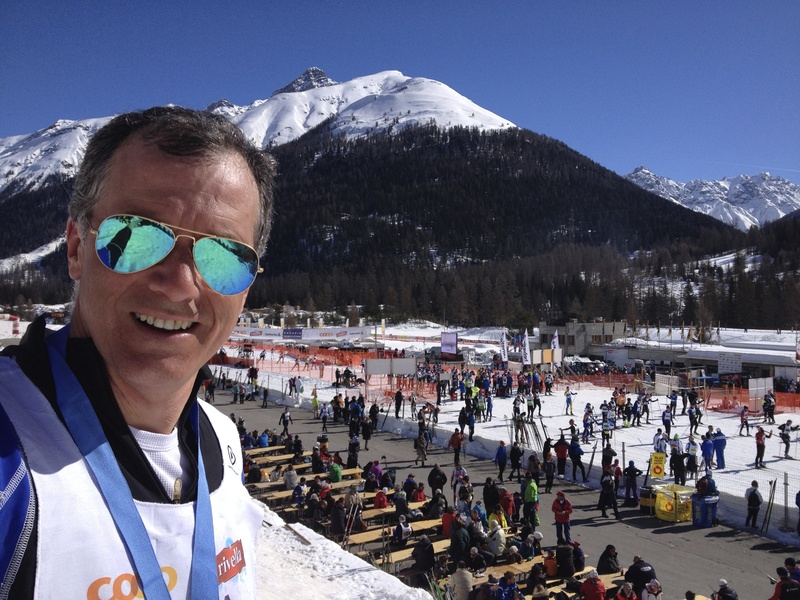 Having completed the Engadin Ski Marathon (held in St Moritz, Switzerland) during the 2013 season, I resolved to try some new races in 2014. This past season I competed in the Dolomitenlauf (Austria), the Transjurassienne (France), and, once again, the Engadin Ski Marathon. What follows is a brief description of my experiences at these races. 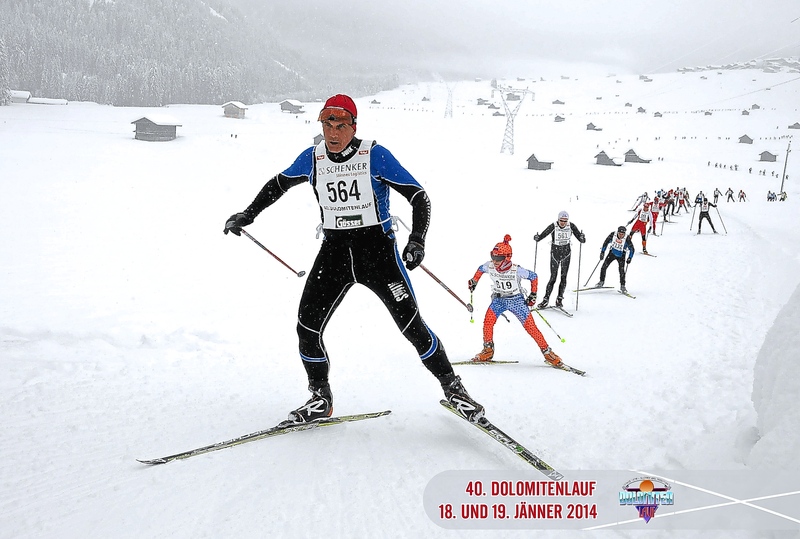 My first races of the season took place in late January near the resort town of Lienz in the Tirolean Alps of central Austria. The Dolomitenlauf offers a double-header of racing: a 42km Classic race on Saturday, followed by a 60km Free technique race on Sunday. The 42km Classic race begins and ends near the village of Kartisch and is run over a demanding course with over 2000ft of climbing. The normal route for the Free technique race begins at lower elevation near Lienz and follows the valley bottom on an out-and-back course. In order to justify the 9 hour drive, I decided to register for both! As it turned out, however, the Free technique race was moved days beforehand to the same course as the Classic race, due to a warm-weather forecast and low snow in the valley bottom. Can’t say I was disappointed! Typical scenery (and weather) for my Dolomitenlauf weekend. I made the long trek to Lienz on a Friday, driving across Switzerland and the western panhandle of Austria, passing through Innsbruck (host city for 1976 winter Olympics) and Kitzbuhel (site of a famous annual World Cup downhill ski race) along the way. I arrived just in time to drop off my skis for race waxing and do a short recon of the start-finish area before checking into my hotel. 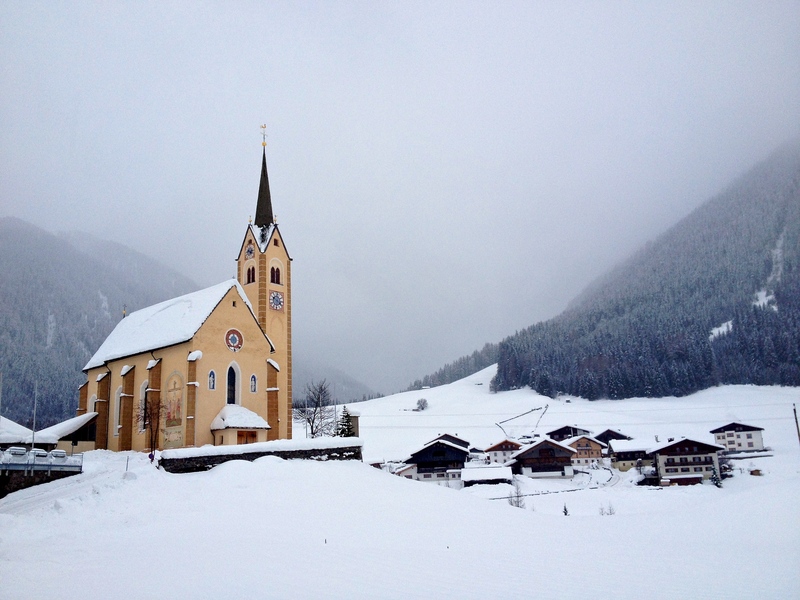 That evening I wandered around Lienz, a charming resort town, and watched the last few heats of a city-sprint xc ski race that was being run on a BMX-like course set up in the main town square using a track made with truckloads of snow. Think short-track speed skating, but on xc skis, through the city streets. It was total carnage for the racers and great fun for the spectators! The Dolomitensprints race course set up in downtown Lienz. The morning of the Classic race I arrived at the site about 90 minutes ahead of time to pick up and test the two pairs of skis I had left with a wax tech the night before. It was a cloudy, misty morning with the temperature hovering a couple of degrees below zero, with a few wet flakes of snow falling. I picked the pair of skis that seemed to be working the best, and then went out for a warm-up ski. About 20 minutes before the start conditions began to change, with a fine drizzle falling and glazing the tracks. Uh oh. Quickly doing another ski test, I found both pairs slipping and losing grip. I was really starting to miss Team Hardwood’s crack group of wax techs at this point! Instead of panicking and trying to make last minute changes (and potentially making things worse), I found that I could get some grip by adjusting my technique. Nonetheless, I headed to the start line anticipating a long and frustrating race. Waiting for the gun to go off in the Dolomitenlauf 42km Classic race. The first half of my race went alright, beginning with a 10km rolling section with gradual climbs, followed by another 10 kms of downhill and false flat, where I could do a lot of double-poling. The wheels started to come off around the 20km mark, as the race entered a 10 km section of climbs that would take us up over a 1000ft. I soon found myself with almost no grip whatsoever and I was wasting a lot of energy trying to stay in contact with the group I was with. Thankfully, it was about here that I spied a Toko wax tent along the trail, where wax techs were offering free treatments of all-purpose spray-on klister. I was pretty desperate so I handed over my skis. It took about 30 seconds and it wasn’t pretty, but I was soon on my way again and able to make better progress up the trail … for about another 3 kms, before the wax wore off or iced up (I didn’t stop to look). The rest of the race was a blur of frustration and toil as I slipped and herring-boned my way up seemingly endless climbs before the final run back down to the finish. I came across the line in 316th place (87th in my age group) in a time 3:28, which was embarrassingly slow, even for such a tough course. 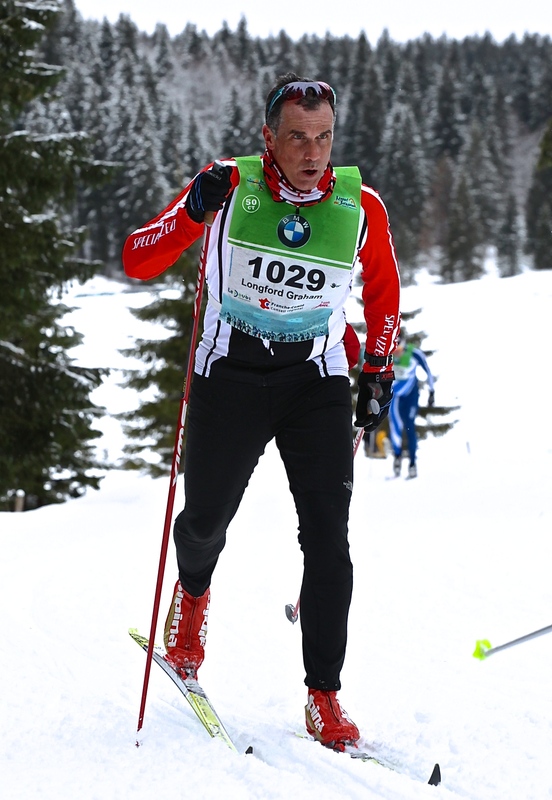 Jerry Ahrlin, the great marathon skier from Sweden, won the race in a time of 1:58. I did manage to come in 2nd among the 20-odd Canadians entered, but drew little solace from the fact. Awaiting the start of the Dolomitenlauf 42km Free technique race. Sunday dawned overcast and a little cooler, with light snow falling, promising better conditions for the Free technique race. The credit-card wax job worked much better than the previous day’s and I was able to pace myself without having to fight my skis and the conditions. I skied a controlled first half of the race, with a little munchkin nipping at my heals most of the way (see photo). Got chased by a munchkin for the first 20kms! I started working harder during the long climbing sections on the second half of the course and found I had good energy most of the way up to the top. Thanks to decent skis I was able to improve on my previous day’s finish by over 100 positions, coming in 214th overall and 29th in my age group (and top Canadian!). Better yet, I improved on my time from the day before by 33 minutes, this despite the fatigue from the day before. All in all a much more satisfying result. 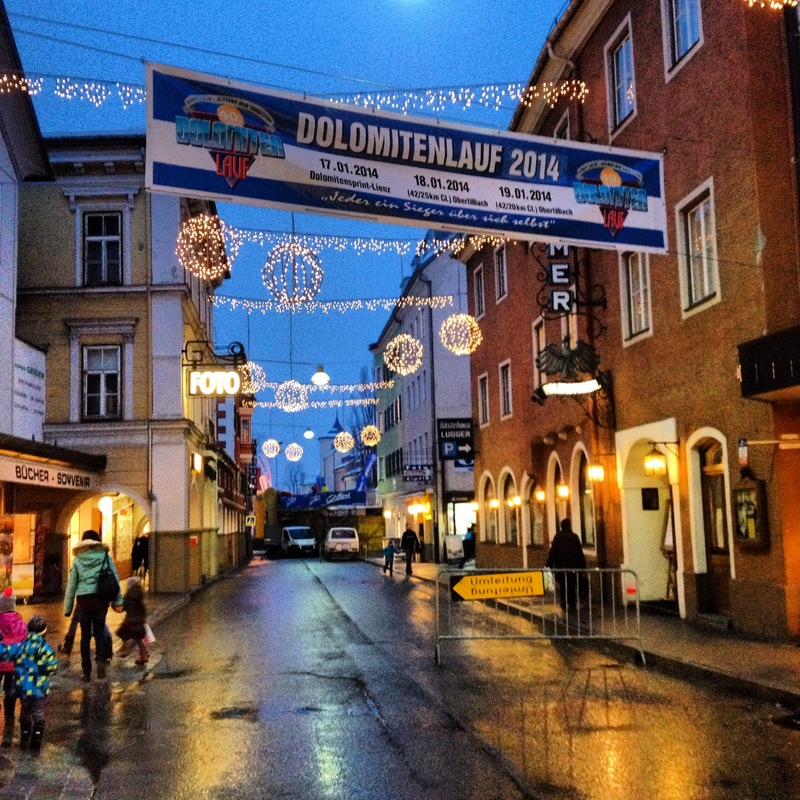 My overall impression of the Dolomitenlauf is that it is a well-run event on a quite challenging course. With about 1,000 competitors racing each day, it is a relatively small event compared to something like the Engadin or the Marcialonga. It’s difficult for me to judge the quality of the scenery on course, as the weather was socked in both days, but the course appears to run through a fairly steep sided valley, and a good portion of it is forested, so it is perhaps not the most aesthetic of European loppets. Also unlike many European loppets, the course runs through no villages, so it is somewhat lacking in the festive feel that other events have. While I was happy to do these races, I’m not sure I will make the 9 hour car trip again anytime soon. Two weeks later I found myself in France for the Transjurassienne, which features a 50km Classic race on Saturday and a 76km Free technique race on Sunday, with shorter courses available on both days as well. The “Transju,” as it is known, traverses the heart of the French Jura, a modest range of mountains that lie along the country’s eastern border with Switzerland. The region is dotted with lakes, farms, forests and rocky ridges, and dozens if not hundreds of cross-country and downhill ski areas, which explains why it consistently produces world class skiers, including 2-time Olympic Biathlon champion Martin Fourcade. 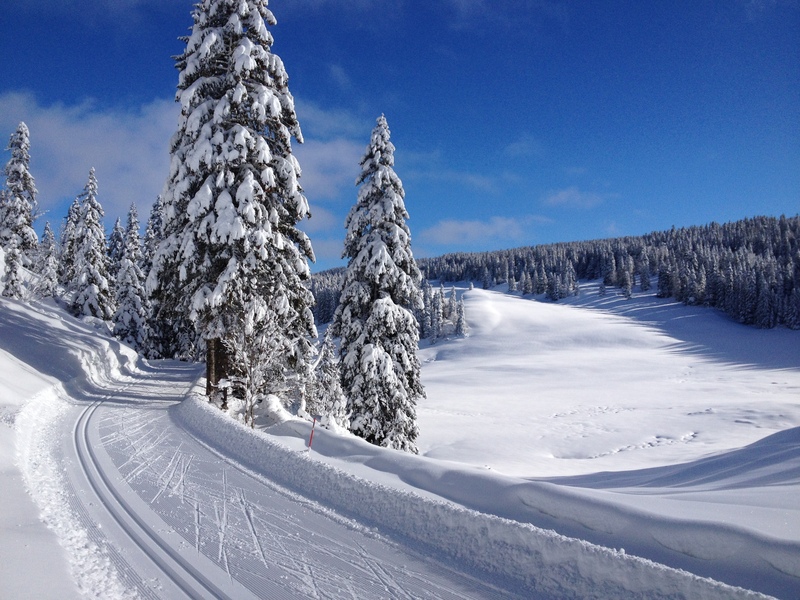 Typical scenery and snow conditions in the Jura mountains. 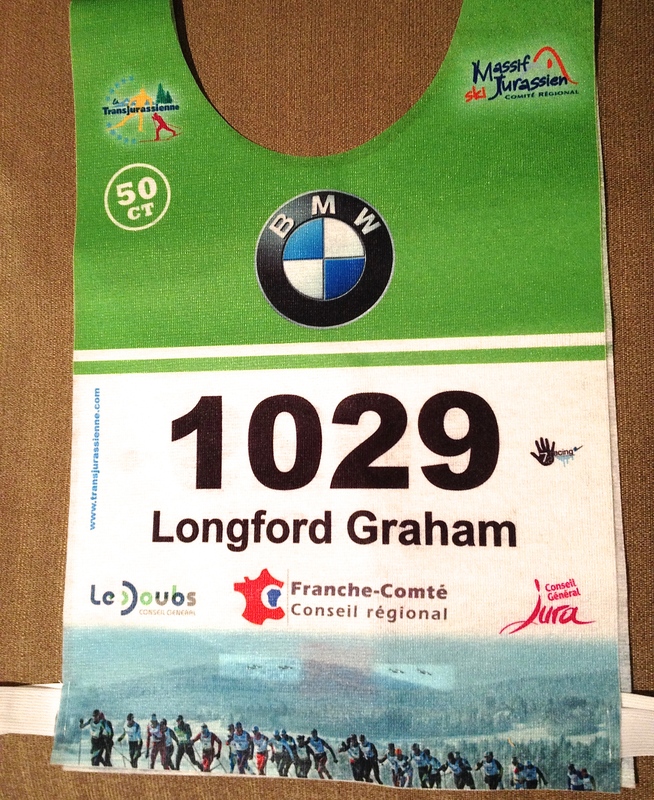 I was excited to race the Transju because the Jura mountains are more or less my winter playground. I train in the Swiss and French Jura 3 to 4 times per week all winter, where I have dozens of great trail systems to chose from, including Les Rasses, the Col du Marchairuz, and La Thomasette in Switzerland, and Premanon and Les Rousses in France. Moreover, it’s all within an hour’s drive! Looking up into the Jura from the Swiss Plateau near Lausanne. While tempted to do the Transju double-header, I elected to sign up just for the 50km Classic race, as I had devoted most of my on-snow training to Classic skiing up to that point and I wasn’t sure I’d have the legs for a 76km skate race the following day. The Classic race course starts in the resort town of Les Rousses and travels north for 50km to the town of Mouthe. I made sure to visit the area several times in the weeks leading up to the race and managed to recon almost every kilometre of the course before race day. The week before the race the weather turned warm and wet and organizers began making contingency plans in case the somewhat thin snow coverage started to disappear. Meanwhile, I started to sweat about another possible grip waxing nightmare, although I resolved this time to wax my own skis. As the forecasts came in the final days before the race, it was starting to look like waxless “zero” skis or “hairies” might be an option on race day. These are skis with a special base material in the grip zones of the skis that, instead of being waxed, are sanded and then treated with either heat or silicon spray to stiffen the tiny microfibres that grip the snow. Zero skis can be very effective in a narrow range of conditions, typically in moist, fresh-fallen snow at about 0 degrees, when most grip waxes are useless. Fortunately I own a pair of these specialized race skis! Ski testing with Coach Pav near Chapelle de Bois in the French Jura. A couple of days before the race I took my zero skis for a test ski on the course. I had a special guest that day too, none other than Ontario Provincial Coach, Pavlina Sudrich, who, as it happened, was in the Jura visiting old friends, in between coaching gigs in Europe. I’ve known Pav for about 5 years now, as a fellow club coach on the Ontario Cup circuit before she moved up to the provincial squad. Pav and I spent a few hours skiing together and came to the conclusion that zeros were the way to go (always good to get a second opinion). On the morning of the race I arrived my usual 90 minutes before the start and quickly tested my zero skis to ensure they were still working. Not perfect, but good enough. I set the zeros aside and went out for a warm up on my training skis. I couldn’t help notice that most of the other skiers were feverishly applying and testing various messy klister concoctions for grip wax that morning, expending a lot of nervous energy in the process. I was so thankful for my zero skis! For some strange reason I was given a fairly low starting bib number and soon found myself near the front of the 1st wave on the start line, just behind the Elite wave. Clearly the Transju organizers hadn’t checked my results from the Dolomitenlauf (thankfully!). I was determined to take advantage and get a fast start in order to avoid the inevitable train wreck on the long downhill that comes a few hundred metres after the start. We blasted off the line when the gun went off and sure enough the bodies started flying on the first downhill, which I managed to avoid with a few quick lane changes. The first 10 kms of the Transju course are flat and fast, and the tracks narrow to 2 lanes after just a kilometre or two, so there was a lot of aggressive passing and jockeying for position. I was soon skiing way above threshhold just to stay with the skiers around me and I soon backed off a little to conserve energy. We still had 45kms to go! After a flat and fast 10 kms the course passes through the resort town of Bois d’Amont, beyond which rises the first big test of the race, the “montee Risoux,” which climbs about 600ft in 6kms, including a 300 foot wall in the first km! It was here that good grip wax was key and my zeros worked as well or better than most skis around me, and already some skiers were peeling off to apply more wax. Feeling the hurt at about the 45km mark. After topping out on the Risoux the race course passed up and over a series of forested ridges broken up by patches of open pasture and countryside, with the occasional hamlet thrown in. The field became more sparse and spread out and I soon found myself skiing with a small group of half a dozen or so. We chased each other through forests and across cow pastures and farmers’ fields for what seemed like a very long time before we finally dropped down onto a long, gradual descent that I recognized as being about 5 kms from the finish. Those of us with some energy left turned on the jets and flew down the descent and out onto a flat field with about 2 kms to go. Three of us had a fun but painful double-pole drag race to the finish and I managed to cross the line ahead of the other two skiers (small victories!). I finished the 51km race in a time of 3:21:30 and came in 153rd overall (18th in my age group) in a field of almost 800. The race was won by the Czech marathon specialist, Stanislav Rezac (a previous winner of the Gatineau loppet), who finished in a relatively slow 2:27:33, reflecting the somewhat sticky, wet course conditions. 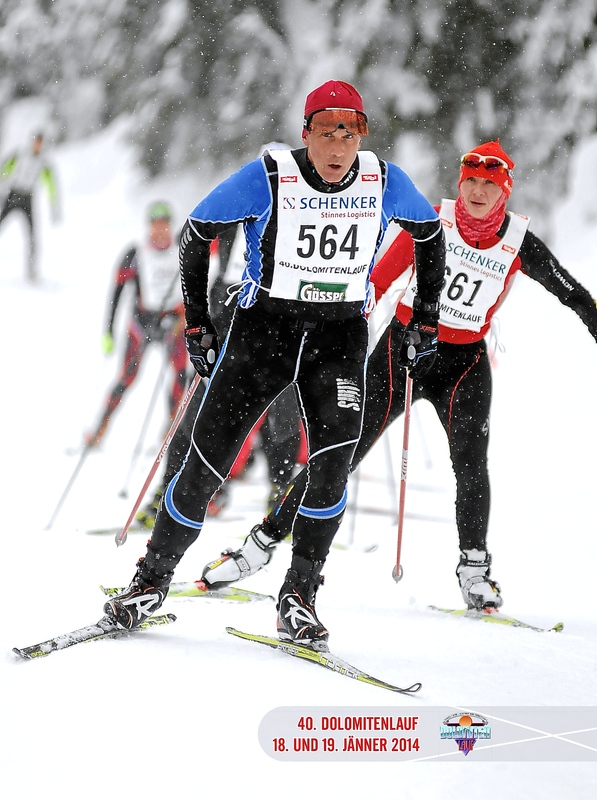 With 13,000 registered participants this year, the Engadin Ski Marathon is one of the largest races in Europe. I raced here last year and loved the beauty of the area and the fast course so much that I decided to return. 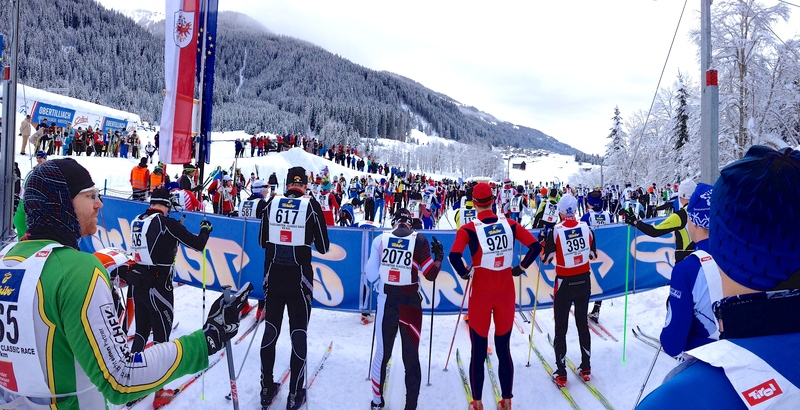 This is what 13,000 xc skiers looks like. The relatively flat and fast course traverses frozen lakes and, after a short rolling section beyond St Moritz, begins a gradual 20 km descent through Pontresina and a half dozen other villages before finishing in S-Chanf. I think it’s the incredible scenery and fast, easy course profile that attracts so many people every year. The only drawback is the relatively high elevation (1800m or about 6,000ft) which, if you’re coming from below 1000m, you definitely feel. Suffice to say that, once again, the race venue and course did not disappoint. 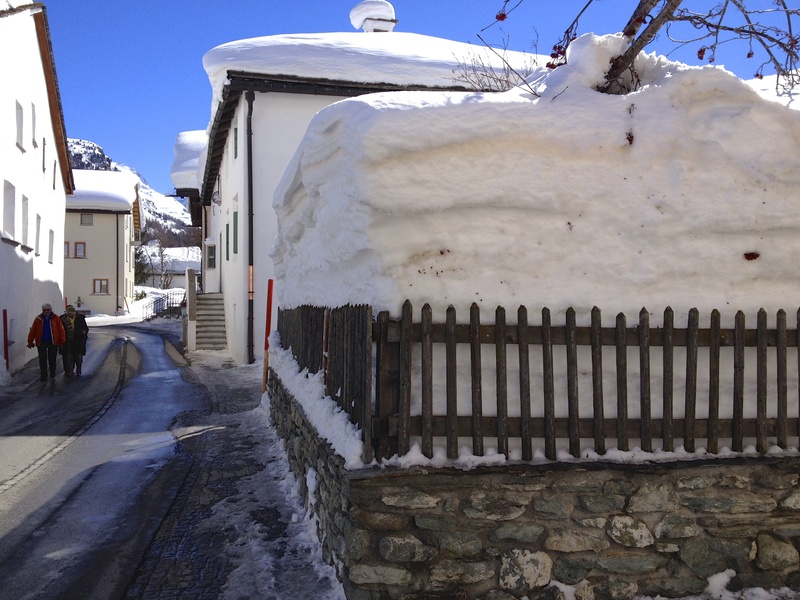 I was happy to return to the Engadin, where the sun was shining and the snow was piled 6 to 8 feet high. I’ll keep the race description brief, you can see last year’s post if you are looking for more detailed information about this race. No shortage of snow in the Engadin valley. For this year’s race I graduated to the “Elite C” wave, which sounds impressive, but I still ended up crammed into a fenced-in start pen with about a thousand other skiers. When the pen was opened it was a mad scramble to run to the start area, put on our skis and go. 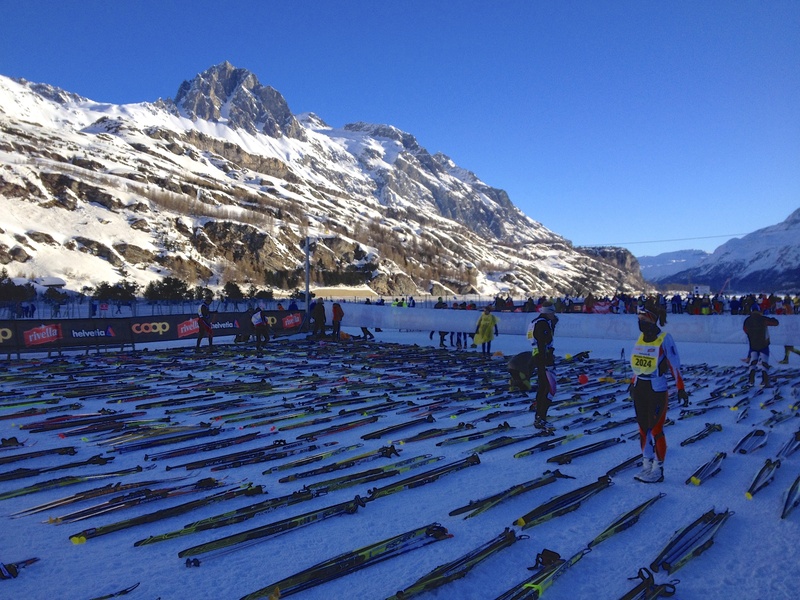 Lining up skis on the Elite start grid an hour before race time. Conditions this year were colder than last year, with a lot more recent, fine-grained snow, and a stiff headwind blowing in our faces. This made for slower conditions than last year, which I noticed immediately as I tried to double-pole in the set tracks beside the main skating lane to avoid early crashes and save my legs. While this had worked well last year, I found myself falling behind the field this year, so I resumed skating with the rest of the bunch. The race passed more or less uneventfully, except for the usual bottleneck at the first steep climb after Lake Sils, and the chaos of descending “Mattress Hill” above Pontresina. I crossed the line in a time of 2:13:34, which was 9 minutes slower than my time the previous year, much of which I attribute to the colder, slower snow we raced on. The time of this year’s winner, Norway’s Anders Gloeerson, was 1:35:05, a full 7 minutes slower than last year’s race. On the upside, I improved on my overall finish (1702nd) by a hundred and fifty places and my age group finish (273rd out of 1759) by over 300 places! I was also top Canadian, although the organizers insist that I am Swiss. I have already made plans for the 2015 season, (although I can’t say I’ve started training). 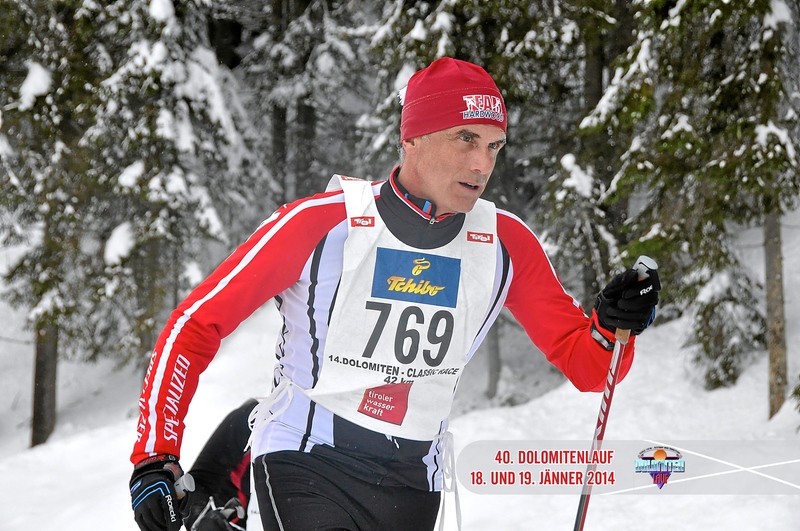 I have registered for the 2015 Marcialonga, a 70km Classic race in the Italian Dolomites that many think is the best loppet in the world! This race features a field of over 10,000 and registration fills up in a matter of minutes each year. I managed to score a bib by hooking up with a tour company that travels to the race. Stay tuned for next year’s report.